If you were to do an internet search on the word pollution you would come up with over 87,000,000 hits. There are studies on all different types of pollution; air, water, noise, light, eb cleansersoil, marine and many others. The EB-Pro ion therapy system was designed to help enhance your body's natural detoxification process. You can visibly see the toxins being drawn out of your body. It does this mainly by removing impurities from the blood in the liver, where toxins are processed for elimination. The body also eliminates toxins through the kidneys, intestines, lungs, lymph and skin. However, when this system is compromised, impurities aren't properly filtered and every cell in the body is adversely affected. Body toxins come from many different sources. 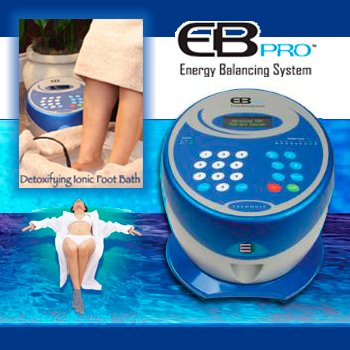 The EB-Pro Ion Therapy device utilizes direct current to create an electromagnetic ionic field in which the patient places their hands or feet in an aqueous salt and mineral solution to increase energy and the positively charged cellular activity through the attached array. Water molecules that pass through the array are split causing the ionic field. The ions are created in two ways. First as the direct current is passed through the water via three metals, the hydrogen and oxygen will separate creating ions. Secondly the softer metals will electronically erode causing further ionization; the ion field can be primarily positive or negative depending upon the electrical polarity going to the array. Information on this tab has been provided by printed material supplied by EB-Pro Energy Balancing Systems. For additional information, you may search www.ebfootbath.com. This information is for general educational purposes only. This information is not intended to diagnosis, treat, or cure any disease, nor should it be considered a replacement for consultation with a healthcare professional. if you have questions or concerns about your health , please contact your healthcare provider.